In today’s world, we expect much from our smart phones. A key feature for most buyers is long battery lives and quick charging times. But, this stretches lithium ion technology to its limits. Not even global tech companies are immune, as seen in 2016 with the Galaxy Note 7. After a number of lithium ion batteries in those phones exploded or caught fire, Samsung issued a global recall and ceased production of the device. It cost them billions in revenue. Battery defects and design flaws were the reported reason. Lithium ion batteries are a type of rechargeable batteries. They operate when lithium ions travel between the anode and cathode of the battery in an electrolyte solution and through a separator. If the battery charges too fast, lithium can form plates around the anode causing a short circuit. Manufacturing defects can also cause problems when tiny metal fragments cause short circuits or minute holes form in the separator. Many lithium ion batteries are a combination of cells. During a thermal runaway one overheating cell can set off the next, leading to a chain reaction of overheating and fire. Store cells in their original containers when practical. Store the cells in a well-ventilated, dry area. The temperature should be as cool as recommended to maximize shelf-life. Observe the manufacturer’s minimum and maximum storage temperatures. Take care so battery contacts do not short circuit. If manufacturer’s guard is missing, install electrical tape over battery contacts. Store the cells in an isolated area, away from flammable and combustible materials. Store depleted cells in an area separate from fresh cells. Keep an ABC dry chemical fire extinguisher for lithium-ion batteries (rechargeable) accessible to the storage area. Never stack heavy objects on top of boxes containing lithium batteries to preclude crushing or puncturing the cell case. Severe damage can lead to internal short circuits, resulting in a fire. Properly dispose of damaged batteries. Justrite recommends storage of lithium ion batteries in our safety cabinets for hazardous materials. These cabinets feature self-closing, self-latching, lockable doors. They are made of non-combustible 18-gauge steel with 1.5-inch air space. Electrically non-conductive poly trays are used on shelves and in the sump. They are designed to prevent the batteries from seeing their auto ignition temperatures as tested in 10-minute fire tests. They also help separate the batteries from incompatible and combustible materials. Use LITHIUM-ION content identification labels (model number 29018, sold separately) to identify the cabinet’s content. All Justrite hazardous material safety cabinets are FM approved. Multiple sizes are available. Justrite supplies hazardous material cabinets for lithium ion battery storage. Our safety experts understand the risks and can advise on your storage application. 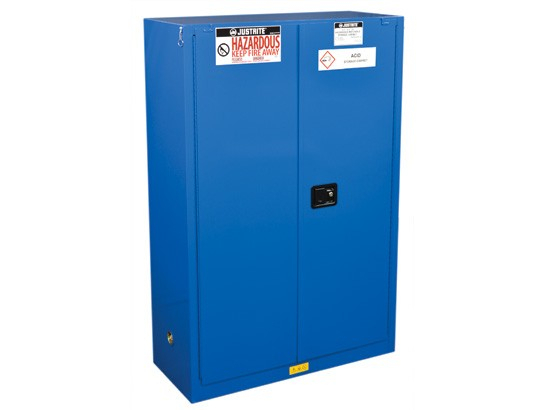 Find out more about our complete line of safety and storage cabinets here. Battery University. Is Lithium-ion the Ideal Battery?